There are few buildings as recognizable in Downtown Miami as 50 Biscayne. This iconic project by South Florida development veterans The Related Group, is known for its colorful columns and unmistakable 10th floor mural embracing the contemporary and tropical style of South Florida artists. The two story, glass-enclosed fitness center and lounge area are also visible from the street and attract the eyes of everyone who passes. 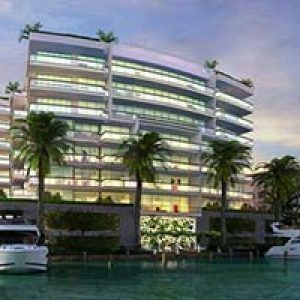 The high end luxury residences at 50 Biscayne certainly have a personality of their own and set themselves apart from the other luxury condominiums on Biscayne Boulevard. Studio, one, two, and three bedroom floor plans are now available for purchase. Studio luxury residences start at $239k with 567 square feet of living space ranging up to 1,789 square foot three bedroom models selling for $1.5M. Located at 50 Biscayne Boulevard, you’ll be in the heart of Downtown Miami with the rest of South Florida at your fingertips. Every residence at 50 Biscayne Boulevard is built to the highest standard of luxury and modern design. With eight-foot ceilings and a seamless flow-through floor plan, you’ll have plenty of room to live, work, and play. Some units feature wraparound balconies with beautiful Intercostal Waterway, Downtown Miami, and Atlantic Ocean views. Kitchens include porcelain tile flooring and Italian cabinetry by Dellacasa. Full-size high-end appliances come built into the granite and quartz countertops. Bathrooms come standard with marble vanities, full width mirrors, decorative light fixtures, and enclosed showers. Some floor plans even come with full-size Jacuzzi tubs. The Related Group is known for developing dozens of luxury condominiums in Miami, and the look and feel of 50 Biscayne Boulevard is unmistakable to anywhere else. In addition to the beautiful rooms and views, all residents at 50 Biscayne Boulevard luxury condominiums are privileged to enjoy 24-hour concierge, 24-hour security, and 24-hour valet parking. The two level spa and state-of-the-art fitness center offer spectacular views while you relax and work out. The styling three story lobby will impress your guests and goes above and beyond the standard two story design so many other luxury residences rely upon. Outside, the property is decorated in beautiful tropical landscaped gardens surrounding a pool deck and infinity edge pool. Also on the ground floor, 50 Biscayne is home to over 13,000 square feet of retail shopping and some of your favorite stores. If all of these amenities and luxury is not enough, a luxury residence at 50 Biscayne could not be in a better place to enjoy all the Miami has to offer. Catch a Miami Heat basketball game down the street at American Airlines Arena, or enjoy the arts at Miami Art Museum or the Carnival Center for the Performing Arts, all within walking distance. Stand out in Downtown Miami, and do not miss out on this opportunity to own a beautiful piece of tropical paradise in South Florida!